Today, more than four-in-ten American adults have at least one step relative in their family – either a stepparent, a step or half sibling or a stepchild, according to a nationwide Pew Research Center survey. People with step relatives are just as likely as others to say that family is the most important element of their life. However, they typically feel a stronger sense of obligation to their biological family members (be it a parent, a child or a sibling) than to their step relatives, the survey finds. Several sweeping changes in the demography of American family life in the past half century – including increases in divorce and in the share of babies born out of wedlock – have contributed to the prevalence of step relatives. Having a stepfamily is not something most people anticipate or plan for, and that is reflected in the survey findings. When asked whether their family life has turned out about as they expected or if it is different than they expected, a 54% majority of those who have at least one step relative say things have turned out differently than they expected. This compares with only 41% of those who have no step relatives. However, different doesn’t necessarily mean worse. Seven-in-ten adults who have at least one step relative say they are very satisfied with their family life. Those who don’t have any step relatives register slightly higher levels of family satisfaction (78% very satisfied). In the Pew Research survey, all married adults were asked to compare the closeness of their own marriage with that of their parents’ marriage when they were growing up. Among married adults with no step relatives, 45% say their marriage is closer than their parents’ marriage was, while 50% say their marriage is about the same as their parents’. By contrast, among married adults who have step siblings or stepparents – many of whom presumably had divorced parents –more than six-in-ten say their marriage is closer than their parents’ marriage was, while roughly 30% say it’s about the same. Stepfamilies can be found among young and old, black and white, and rich and poor. However, there is a distinct demographic pattern in the incidence of stepfamilies among American adults. Young people, blacks, and those without a college degree are significantly more likely to have step relatives. 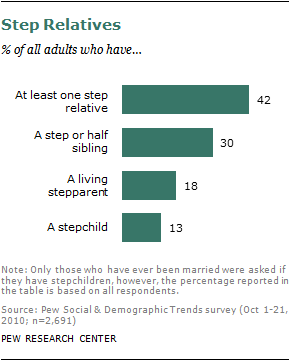 Among those under age 30, more than half (52%) report that they have at least one step relative. This compares with 40% of those ages 30 and older (including only 34% of those ages 65 and older). This is not surprising given that young adults are much more likely than their older counterparts to have grown up with parents who were not married. In the Pew Research survey, 36% of those under age 30 said during the time they were growing up their parents were either divorced, separated or were never married. This compares with 21% of those ages 30-49 and only 10% of those ages 50 and older. A higher share of blacks than whites or Hispanics have step family members. Among black adults interviewed in the Pew Research survey, 60% have at least one step relative. This compares with 46% of Hispanics and 39% of whites. The biggest gap between blacks and whites is in the proportion of each that has step or half siblings. Some 45% of black adults report having at least one step or half sibling, compared with 26% of whites. Roughly the same proportion of blacks and whites have a living stepparent. And blacks are somewhat more likely than whites to have stepchild. Among blacks, there is a large gap in the percentage of men and women who report that they have stepchildren. One-in-four black men (24%) say they have a step child, compared with 14% of black women. Black men are also much more likely than white (15%) or Hispanic men (7%) to say they have stepchildren. In addition to age and race, socioeconomic status is linked to the prevalence of stepfamilies. Only a third of college graduates say they have at least one step relative. By contrast, 46% of those without a college degree have a step relative. Similarly, stepfamilies are less common among those with higher household incomes. While 36% of those with annual incomes of $75,000 or higher say they have at least one step relative, 43% of those making between $30,000-$74,999, and fully half of those with annual incomes of less than $30,000 say they have step family members. Previous Pew Research Center analysis revealed a steady decline over the past 50 years in the share of American adults who are married.2 According to that analysis, the falloff in marriage rates has been more dramatic among certain demographic groups – and those are the same groups that are more likely to be living in stepfamilies today. For example, blacks are much less likely to be married today than they were 50 years ago. In 1960, 61% of blacks ages 18 and older were married; by 2008 only 32% were married. Marriage rates have also declined among whites and Hispanics over the same time period though not as sharply. In addition, a large marriage gap has emerged between college graduates and those without a college degree. Today, marriage remains the norm for college graduates, while fewer than half of those who did not graduate from college are currently married. Most adults who have step relatives feel a stronger sense of obligation to their biological family members than they do to their step kin.3 The Pew Research survey asked respondents how obligated they would feel to provide assistance to family members who were dealing with a serious problem and needed either financial help or caregiving. Survey respondents were asked about a list of family members including parents, siblings, children, stepparents, step or half siblings and stepchildren. They were also asked how obligated they would feel to help out their best friend. Overall, parents rank the highest in the hierarchy of family obligations – 83% of those with a living parent say they would feel very obligated to provide assistance to their parent if he or she was faced with a serious problem. Among adults who have both a living parent and a living stepparent, 85% say they would feel very obligated to help out their parent, while 56% say they would feel a similar sense of obligation toward their stepparent. Parents feel almost as obligated to their grown children as adult children feel to their aging parents. Overall, 77% of parents with at least one grown child say they would feel very obligated to help that child if need be. Among adults who have both a grown biological child and a grown stepchild, the biological child exerts a stronger pull. Nearly eight-in-ten (78%) of these parents say they would feel very obligated to provide assistance to a grown child. Closer to six-in-ten (62%) say they would feel equally obligated to their grown stepchild. Similarly, adults are more inclined to come to the aid of their biological siblings than they are to assist their step or half siblings. Among those who have both biological siblings and step or half siblings, 64% say they would feel very obligated to a sibling who was in serious trouble. 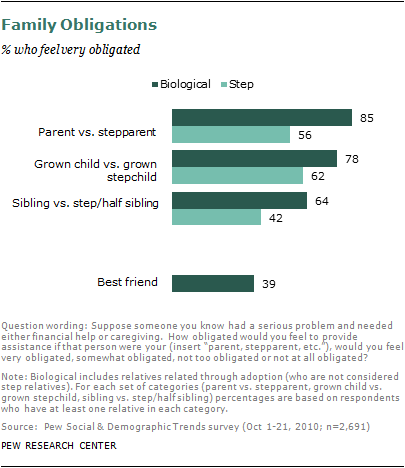 Only 42% say they would feel very obligated to provide assistance to a step or half sibling. However, even though step relatives trail biological relatives in each of these measures, they do slightly better overall than “best friend.” No matter what their family constellation, all survey respondents were asked how obligated they would feel to assist their best friend if he or she was faced with a serious problem. Just 39% of adults say they would feel very obligated. Results for this survey are based on telephone interviews conducted with a nationally representative sample of 2,691 people ages 18 and older living in the continental United States. A combination of landline and cellular random digit dial (RDD) samples was used to represent all adults in the continental United States who have access to either a landline or cellular telephone. A total of 1,520 interviews were completed with respondents contacted by landline telephone and 1,171 with those contacted on their cellular phone. The data are weighted to produce a final sample that is representative of the general population of adults in the continental United States. Interviews were conducted Oct 1-21, 2010. Margin of sampling error is plus or minus 2.6 percentage point for results based on the total sample at the 95% confidence level. Survey interviews were conducted in English and Spanish under the direction of Princeton Survey Research Associates International.